The Life Fitness X5 Elliptical Trainer is ON SALE! The Life Fitness X-5 elliptical trainer is a sweet machine. It is pricey, but that is the price you pay for quality. Life Fitness is one of the best elliptical trainers available for the residential market. When you get on one it is not only solid and durable, but it has that smooth elliptical motion that you only find in high-end machines. The one feature on the X-5 that sticks out is the SelectStride Technology. The problem with elliptical trainers is they usually have one stride length. That is find if there is only one user, but if you have multiple users at different heights, someone will suffer. With the SelectStride you can adjust the stride length to your comfort range. A smart idea! The Life Fitness X-5 with the Advanced Workout Console typically sells for $3,499 with shipping. This model has been permanently DISCONTINUED. Instead, we’d recommend you check out the Life Fitness E5. It’s a similar machine but now has electronic stride adjustment instead of the manual on the X5. 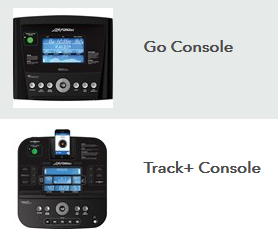 If you go to the web site you will notice there are two console options: the Go Console and the Track+ Console. The difference is around $400. With the Track+ version, you get more of a variety of programs and the ability to sync with Apple and Android devices. If you are going to spend this much money, you may as well get all the bells and whistles. I like the idea of having the heart rate monitoring and control sensors in the moving handlebars. I personally don’t like wearing wireless heart rate straps. Another plus is the X-5 weighs a hefty 251 lbs. This really contributes to the stability. Moreover, when they say it has a user weight limit of 400 lbs, they are probably in the ball park. I find it humorous when manufacturers of budget fitness equipment make the same claim for machines in the $1,000 price range. These ellipticals usual weigh about a 100 lbs. less. The warranty gives you 5-years on the parts and 1-year labor. These are generally low maintenance machines, so the warranty is not as important an issue as if you were buying a ProForm. You won’t be disappointed with the Life Fitness X-5 elliptical. My only suggestion is you go out and test the X-5 and the comparably priced Precor elliptical. Both build commercial grade ellipticals. You will find they are popular in health clubs. That commercial grade quality is also evident in the residential models.